I'm seriously looking at purchasing a Technics 1200GR TT. I like the idea of pitch control. Many years ago, owning both DD and Belt driven turntables, I always felt the DD seemed more precise. Maybe due to the strobe platter edge. 1. how does belt wear effect speed accuracy? How long should a typical belt last? 2. how does one hook an external speed control to a typical TT? 3. Is it a myth that DD turntables are more speed stable? A good DD table is more speed stable than any belt drive. Wow and flutter numbers for the best DD tables are very, very low. 1) Depends on the belt and the turntable. I've heard of people using belts for years and people having to change them once a year. Note that not everyone is constantly checking the speed on their TT, so some people may be using belts longer they they should. 2) It varies depending the type of unit. Some merely have you plug the turntable's power cord into the unit, then plug the unit's power cord into the wall outlet. Not all BD turntables are compatible with speed controllers, and not every speed controller will work with every turntable. You have to do your research. Also keep in mind that some companies charge quite a bit for their speed controllers. For example, the Polytable controller is ~$700, and VPI charges ~$1,000 for their unit. tmtomh, Paully, Shawn and 4 others like this. I think I will keep focusing on the Technics 1200/1210 GR. Looks like a winner all around. I like to visually see the speed stability with the strobe. Plus, I can have quick change headshells for different cartridges with minor TA adjustments (mono, 78, etc). Szeppelin75, timind and patient_ot like this. Of course it depends on many factors, including what "level" of TT you are comparing and how much you want to spend -- but ^^^^^ quote above hits the high points. displayname and patient_ot like this. I am not disagreeing with your basic premise, but I do have a VPI Aries 3 that I modified to use 3 belts that measures .02 at 33 1/3 and .01 at 45 using the Feickert measurement software, but I am sure that there are DD that can better that. I recently got a vintage 70s Pioneer quartz lock DD. I will have to measure that with the software. Paully, HiFi Guy, DrZhivago and 5 others like this. You are not special in having this requirement. Most likely everyone here with a turntable has it and is very much satisfied with what they have. No one here would be happy with speed being noticeably changing even if it is barely noticeable. You want pitch control which the Technics clearly has. As far as speed stability my Technics is at the top and my VPI Classic is also known to be a performer(on par with master tape as per VPI.) I find both of them are spot on - no discernible differences in that area. Also note I’m on the original belt 2009 VPI. Belt or DD is up to you. If you like playing with the speed the the Technics will be pleasing and a good choice. When you ask about speed accuracy, are you referring to strict adherence to the intended speed (i.e., 33.33 rpm ±0.00%) or are you more concerned with speed stability, which can mean "drift," observable visually with a strobe, or short-term fluctuations which can be quantified in terms of wow & flutter measurements? A DD can have a low wow & flutter spec and still be somewhat imprecise. A quality belt drive with relatively low wow & flutter can be quite accurate, particularly if has variable pitch control and a strobe. I have a direct-drive Technics SL-1200 MK2 and a belt-drive Dual 510. Both are very capable performers. As far as I'm concerned, speed accuracy is not an issue with either. Regarding belt replacement, I bought the Dual new in 1976 or so and didn't change the belt until maybe 5 years ago...and that was only because I thought it was prudent, not because of any issues. I can't speak for other belt-drive turntables. If OP can scientifically prove to me (double blind and the works) that they can hear speed variation on a properly functioning, brand new 1200 GR, that is not due to pressing defects on a record or anything else that has nothing to do with the turntable itself, I will send OP a brand new audiophile record. Mmmark, Shawn, LarryP and 1 other person like this. The reason I sold my VPI and started using my old Kenwood 750 again as my so-called reference TT was because of speed issues I had w/the VPI Scoutmaster I had. The Kenwood is far better in wow and flutter. I have never heard Wow & Flutter on any Technics TT. But I have on some of the cheap DD turntables, when I was shopping during the 70s. And sadly, I have heard W&F at shows, much more recently, with the Air Force 1, a VERY expensive Japanese Direct Drive turntable, that uses a servo to control speed. THAT was a shock to me. I have a Kenwood KD500, a Yamaha PF 50 and an Audio Technica AT LP120 usb. All three are dead on accurate and all three are also dead quiet. I have the AT for playing through headphones via my computer (I use the USB) while surfing and posting. I noticed, yesterday, that I was reefing on a goodwill find with my discwasher, really slowing down the motor, and it suddenly hit me that if it were a belt drive, I'd have to worry about stretching or breaking a belt. With DD, you don't even think about your drive system. No broken belts, no speed differences due to wrong belt dimensions, etc. And the point of my post is to point out that I'm experiencing this at all price points - at least, so far. You just play your records and listen to the music without a care regarding maintenance. BrentB and timind like this. Wow and flutter is not measured on reputable classic turntables with an iphone app. It is measured with a test tone record and a wow and flutter meter, so specifications reflect playing music. Byrdsmaniac, p147, SandAndGlass and 3 others like this. Both my Yamaha and JVC are "cheap" by high-end standards but have never given me speed trouble. I can't speak for some of the earlier direct drives with no quartz lock, that used pitch controls, as I have only heard them here and there and not extensively. I have heard w/f on cheap belt drives but it's not an issue with nicer, more expensive models. Not familiar with the Air Force TT but it sounds like something went wrong there. Perhaps they need to go back to their test equipment and see where they screwed up. When I pulled my KD500 out of storage back in 1999 (or so) it would not lock on to speed. I gave the speed knobs a few turns and it didn't really help. You could actually watch the strobe indicate it was on speed and then suddenly would drop significantly, then pick up too fast for a sec, then settle, then drop. What DID help was to just let it run for about 24 hours straight and de-oxing the speed controller knobs. It's been rock steady ever since. Grant and patient_ot like this. The issue with the phone apps is that they vary, and they rely on the phone's gyroscope which also varies. 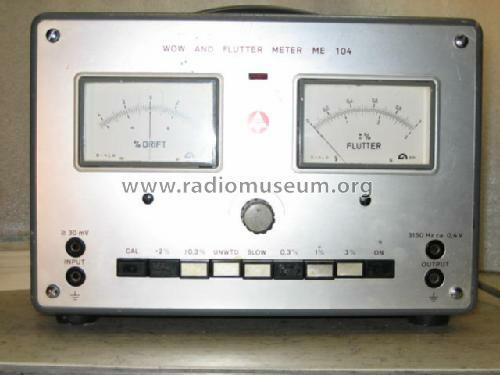 With something like this meter box, or recording a test tone record into software, you need to be 100% sure the record is well pressed and not off center. I have seen some newer test records that are horribly pressed and utterly useless. Yikes. Did you have an electronic speed controller on the VPI? I don't think it is so easy to answer the OP because not all belt drives are equal, nor are direct drives. It really comes down to the engineering and quality of the drive mechanism. Both belt and direct drives have pluses and minuses, but the given the best belt drives in the world vs. the best direct drives, I would tend toward direct drive. I am debating between a VPI Avenger with belt drive vs their Direct Drive at some point, and Harry Weisfeld's additional insight has me leaning toward the direct drive. In Harry's words, it is not that perfect platter speed is the main issue. Harry stated that "being off by .01% means less than nothing, the only thing that matters in a turntable is microsecond to microsecond speed stability. If you want to read out your speed that is fine, that's your business and I would not take that away from you. But your reading something that has already happened. The trick to a real life sounding table, as we found out in the rim drive and then in spades with the direct drive, is the INSTANTANEOUS speed stability. By the time a belt has stretched and the system tells it to correct, it is already way to late, it has happened already! The trick to the best table sound is to drive an AC motor in real time with a clean perfect signal that is strong enough and quiet enough to not change motor speed... What is important and what isn't and I can tell you absolutely, 100%, the micro second to micro second speed swamps everything else. Most people have never heard the VPI Direct Drive but there is a reason that the basic model is in Class A+, the Titan and Vanquish DD wipe out the Class A+ table Fremer reviewed, it is this growth that comes from knowledge of what is wrong, what makes a piano sound like a piano, and how to fix it and make it sound real. Absolute speed is not in the top 5 items of this discussion." I am certainly no expert in this, but definitely food for thought. Ski Bum, Grant and McLover like this. The best DD turntables have the edge in speed stability, but the best belt drives are not far from a DD in speed stability. Even classics like the AR turntables, and the Empire models and Thorens are very accurate in good working order. Grant and David Fischer like this. Agreed. There is a lot to consider, and speed stability is just one of many. I've heard many comment on how low the noise floor is on the VPI direct drive, even in comparison to their best belt drives. Wish I could A/B them. You bring up a key challenge to this site. It's like a car site where one user want's to know which is best, a used Honda or a used Mitsubishi. Then another want's to know if he should pull the trigger on a Bently Bentayga vs Continental GT. One post might as well be about horses and the other about cooking. My comments are always at the Honda/Toyota/BMW/Corvette level. The exotics don't really exist to me, other than to look at. There is no noise on my VPI Classic - I'm not sure how you best that. Same goes for the Technics. Try as hard as I can (headphones) - no noise. Good to know though that they get beyond no noise.